Note by the LeftEast editors: this article has been reprinted from the blog of Gavin Rae, Beyond the Transition, with the author’s permission. This article shall consider the contents of the Act; the reactions to it; and what wider repercussions it may have. “Whoever claims, publicly and contrary to the facts, that the Polish Nation or the Republic of Poland is responsible or co-responsible for Nazi crimes committed by the Third Reich, as specified in Article 6 of the Charter of the International Military Tribunal enclosed to the International agreement for the prosecution and punishment of the major war criminals of the European Axis, signed in London on 8 August 1945 (Polish Journal of Laws of 1947, item 367), or for other felonies that constitute crimes against peace, crimes against humanity or war crimes, or whoever otherwise grossly diminishes the responsibility of the true perpetrators of said crimes – shall be liable to a fine or imprisonment for up to 3 years. The sentence shall be made public. The first thing to note here is what has been omitted from this bill. It does not include the phrase ‘Polish Death Camps’, although it has been widely reported in the international media that this is in the Act and has regularly been used as a justification for it in Poland. This phrase has been used in the past by some international politicians (most notably Barak Obama) and in the international media. This was generally used to denote the geographical location of the camps, although this was rightly strongly condemned by all Polish governments, which tended to reduce its use. The phrase was never used inside Poland and as this law can only be applied in Poland, it would have been of no practical use anyhow. The absurdity of the present situation is that the phrase has spread around the world over the past week, with tweets including it reaching tens of millions of people; with some of those hostile to the Act using it as a way to criticise the Polish government. The wording of the present bill is actually far more ambiguous and dangerous than this, with the term ‘co-responsibility/responsibility’ open to misinterpretation and abuse. The holocaust was an act planned and carried out by the German Nazis in Poland which was under their occupation. The Nazis regarded Poles, as being part of an inferior Slavic race and if they had won the war they would have undoubtedly have attempted to completely destroy Poland and the Polish people. Poland (both Catholics, Jews and others) suffered the largest loss as a percentage of its population of any country during World War Two. Most of its infrastructure, industries, and cities (over 85% of Warsaw’s buildings) were destroyed by the Nazis. The Nazis built most of its concentration camps in occupied Poland and carried out the systematic killing of three million Jews (over 90% of the pre-war Polish-Jewish population). A further estimated 2 million non-Jewish Poles perished during the Second World War. From the beginning of the occupation of Poland, the Polish population was subject to terror, mass executions and indiscriminate retributions against whole communities in which there was resistance. The occupation of Poland was harsher than in any Western European country. There was no collaborationist government created in Poland and Poles organised the largest resistance movement to Nazi occupation in Europe. Occupied Poland was the only territory under Nazi occupation, where any kind of help for Jews was punishable by death not just for the helper but also for their entire family. Despite this, Polish citizens have the world’s highest count of individuals who have been recognized as Righteous Among the Nations as non-Jews who risked their lives to save Jews from extermination during the Holocaust. It is estimated that around 50,000 Poles were executed directly for helping Jews. It is perhaps impossible to imagine what it was like to have lived under this occupation and to try to think how one would have acted in such a situation. The destruction, fear and barbarism inflicted by the Nazis on Poland was simply on a scale which is not possible to comprehend. The Poles were victims of this occupation. There is no ‘but’ which can follow that sentence, no qualification that can be added which can in anyway demean it. The occupation took place in a society that was divided before the war, in which growing right-wing nationalism (that had spread throughout the continent) was often combined with antisemitism against the large Jewish population. During the war these divisions were exploited by the Nazis and there were cases when some Poles instigated the killing of Jews. No country is made up of just good or bad people and no history is ever black and white. The new law not only clouds history but uses the tragedy of the Nazi occupation for current political gain. 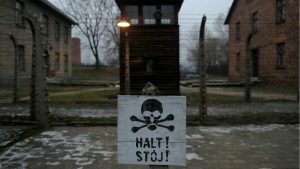 The Polish government and right-wing media are ratcheting up the atmosphere in Poland by spreading the belief that there is an international campaign to blame Poland for the holocaust and to claim that the concentration camps were ‘Polish’. The bill potentially moves the painful discussions between communities and amongst historians to the courts and spreads uncertainty and fear about what can be said. Some leading politicians connected to the government (such as the Education Minister Anna Zalewska) have cast doubt on the judgement previously passed by the Institute of National Remembrance that the massacre of Jews in the village of Jedwabne was carried out by Poles. Imagine for a moment that this ruling was reversed by the government, would it then be illegal to state that Poles were responsible for this tragedy? The political purpose of this bill seems to be one of inflaming the emotions and hostilities within a section of the Polish population. After running a negative propaganda campaign against refugees and Muslims, the right-wing government and media are now opening up the Pandora box of antisemitism. 2018 marks the 50th anniversary of one of the darkest passages in the history of the Polish People’s Republic, when thousands of Jews were expelled from the country Within contemporary Poland (where there is now a very small Jewish population) antisemitism remains high, although it had been steadily declining. From the early 1990s to 2005 those expressing a dislike for Jews stood at around half of the population. However, this had declined to just 27% by 2010 (when for the first time more Poles had a positive than negative attitude towards Jews); before then rising to 32% in 2015. This Act has provoked an explosion of antisemitism on social media led by a vocal racist minority in the country. Prominent right-wing publicists have joked that perhaps we should also use the phrase ‘Jewish Concentration Camps’. At a demonstration organised by the far-right National Movement outside the President’s Palace (campaigning for him to sign the Act), a banner was unfurled with the slogan urging President Duda to “tear off his yarmulke”. The government has also responded with its own campaign based around the slogan ‘German Death Camps’. The government claims that the fact that the concentration camps were German and that the holocaust carried out by Germans should always be underlined. Recently, there have even been calls for the names of concentration camps such as Majdanek or Auschwitz to be changed to include the word German. This is based on the falsehood that people from abroad do not understand who the Nazis were and where they came from. By consistently emphasising the obvious fact that they were German, downplays the fact that they were fascist camps. It is overlooked that fascism was not confined to Germany or unique to it; that some collaborated with it; and that it remains a threat today. This revision of history has been accompanied by members of the government and right-wing media claiming thatHitler was actually ‘left-wing’. A prominent right-wing historian, Piotr Zychowicz, who has popularised this absurdity, even published a book claiming that the best solution for Poland in 1939 would have been to have allied with the Third Reich and helped to defeat the Soviet Union. The right-wing nationalist reaction in Poland has been replicated by some similar responses by sections of the Israeli right. The Jewish community, domestically and internationally, had criticised the bill before it was passed in parliament; and after its passing, the condemnation of the bill was immediate and strong, expressing the real fear that open discussion about the holocaust in Poland will be censored.However, the reactions of some Israeli politicians have themselves been inflammatory and offensive.For example, the opposition party leader, Yair Lapid, tweeted that the Holocaust : ‘was conceived in Germany but hundreds of thousands of Jews were murdered without ever meeting a German soldier. There were Polish death camps and no law can ever change that.” Also the Education Minister, Naftali Bennett’s, proposed visit to Poland was cancelled due to him claiming that “many Polish people, all over the country, chased, informed or actively took part in the murder of over 200,000 Jews during, and after, the Holocaust’ and that he would come to Poland to tell the truth. Bennet is a member of the extreme right-wing Home Party who believes that there is no room for Palestine in the ‘God-given’ Land of Israel. History is never discussed in a vacuum but is shaped by contemporary political events. Relations between Ukraine and Poland have been in flux in recent years. Poland was a strong supporter of the Maidan protests in Ukraine, the overthrow of the Yanukovych government and they backed the Ukrainian government in the military conflict in eastern Ukraine. Prominent politicians from Poland, including the now ruling party PiS (amongst them Jarosław Kaczyński), took part in the Maidan protests in Kiev. The raising of the historical nationalist flags of the Ukrainian Insurgent Army (UPA) and thegrowth of right-wing nationalism and paramilitary units was largely ignored by Poland and the West. In April 2015, the Ukrainian parliament even passed a law recognising UPA as a ‘fighter of freedom and independence’ on the same day that the then Polish President Bronisław Komorowski had addressed the Ukrainian parliament. Such hypocrisy and irresponsibility is not confined to Poland, with western politicians and commentators of all political stripes (not least those who profess to be the most liberal) condemning any criticism of the far-right in Ukraine as being exaggerated and simply Russian propaganda. Ukraine has been undergoing its own process of historical revisionism and censorship. As well as praising the Ukrainian nationalists (many of whom participated in the murder of Jews and Poles and fought alongside the Nazis) the Ukrainian government has begun to censor those who present another version of history. Antony Beevor’s bestselling history book Stalingrad has been banned by the Ukrainian government, for a passage telling how 90 Jewish children had been shot by Ukrainian militia “to save the feelings of the Sonderkommando”, the work units made up of the Nazis’ death camp prisoners. The Ukrainian government has condemned the Polish law on ‘Ukrainian’ war crimes saying that it curtails freedom of expression and is a step towards party censorship. Whilst they are undoubtedly correct in this respect, they fail completely to recognise how they are making the same mistakes. Nationalism is rising in both Poland and Ukraine and both populations have historical grievances against the other. Furthermore, there has been a huge migration of Ukrainians to Poland over the past couple of years, with around two million Ukrainians now legally working in the country. These migrants have largely successfully integrated into Polish society, although attacks on Ukrainians in Poland have been growing. However, the growth of nationalism in both countries and the opening of historical disputes between them potentially threatens these largely peaceful relations. One of the most curious aspects of these events is the changing international relations between the USA and three of its closest international allies: Poland, Israel and Ukraine. Why the Left in Central and Eastern Euro ..
European Elections in Poland Confirm the ..
On the day that the Act was passed in the Polish parliament, the US Secretary of State, Rex Tillerson, was visiting Warsaw as part of an international tour. He did not make any statement about the Act at the time and it was only after Israel complained about the Act that the US government also responded with a similar condemnation. It can only be assumed that the Polish and US governments were taken by surprise by the reaction of Israel. Recently Poland has strengthened its relations with Israel and the USA, as those with the European Union and Germany have soured. Poland was only one of a few countries that did not vote against the US bill at the United Nations to recognise Jerusalem as the capital city of Israel; and it recently signed a memorandum of intent to buy both the Patriot missile system from the USA along with interceptor missiles from Israel’s David Sling missile defense system.Moreover, as noted above, Poland and Ukraine had become strong allies, united in their attitudes towards such things as international economic sanctions against Russia and increasing the military presence of Nato in the region. The Polish Act on Historical Memory has revealed Poland’s growing tensions with Israel and Ukraine. This is partly an effect of the weakening of America’s international power. America continues to be world’s largest military power and the greatest exporter of arms in the world. It is strategically allied to Ukraine and Poland as part of its long stated aim of extending its military to Russia’s borders; and Israel is its main ally in the Middle East and reliant upon American arms and military support. This reality is not going to change soon and therefore it is to be expected that eventually some form of compromise may be found that can at least temporarily calm down the tensions between these three nations. However, any global hegemon has to have a mixture of ‘hard’ and ‘soft’ powers. America no longer has much to offer these countries beyond selling its weapons and providing its ill-fated security. Its declining economic weight in the world means that the USA is no longer able to pay for complicity and export its vision of the ‘American Dream’ as it once had. During the Trump era, its flawed image as a defender of human rights (even at home) is exposed as a fraud. By backing the nationalist and conservative administrations within its own allied states, the USA is helping to build nationalist hostilities between these counties. The reopening of historical disputes, reaching back to World War Two, reflects how many of the stabilities and securities of the post-war world continue to disintegrate. Gavin Rae is a sociologist living in Warsaw. He has written extensively on issues surrounding the transition in Central and Eastern Europe and European Union expansion, with particular focus on Poland. 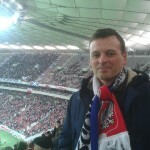 His book Poland’s Return to Capitalism was published by IB Tauris, he runs the blog Beyond the Transition.